The recommended value, provided by the EC8, for β is 0.20. Example : for importance class II → γI = 1.0, soil type B → S = 1.2, seismic zone withagR = 0.24 and q = 4.5, for values of Τ 0.1, 0.25, 1.0 and 3.0, the corresponding values of Sd are 0.171g, 0.16g, 0.08g and0.048g. Setting agR = 0.24, S = 1.2, γ I = 1.0 yields γ I · agR · S = 1.0 ·0.24·1,2 = 0.288. When demanding conditions occur, e.g. 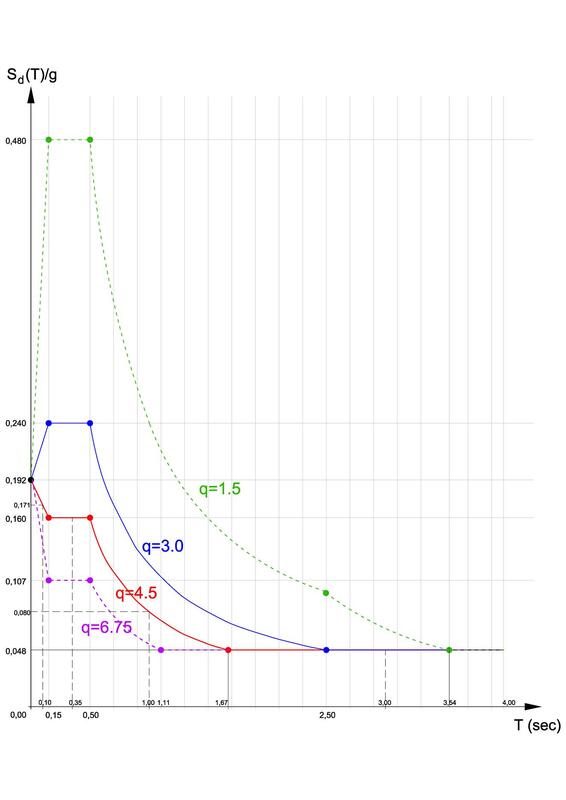 in multistorey planted columns, it is imposed for the vertical accelerations to be taken into account and maybe even a uniform value q = 1.5 should be considered for the whole structure, used for the calculation of the horizontal accelerations. In a serious case, it is useful to also consider the structure without the diaphragmatic behaviour of floors, at least at nodes where particularities exist, so that an exact value of the vertical seismic acceleration is obtained at the critical nodes. For practical and safety reasons, the vertical acceleration of critical nodes may be taken equal to the maximum vertical accelerationaV occurred at any node. This maximum vertical acceleration is equal to aV,max = 0.9·γI·agR·2.5/1.5 → aV,max = 1.5·γI ·agR.